Life Before the Dinosaurs: Isotelus. 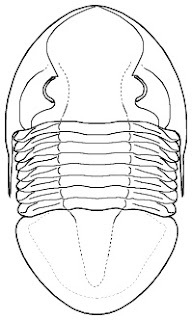 Isotelus is a trilobite that lived in the Ordovician Period. The biggest species of Isotelus is I. rex, which is one of the largest trilobites found yet. I. rex was about three feet long. Isotelus has been found in the United States, Canada, and Europe, and is the state fossil of Ohio. Isotelus rex is on the far right. Isotelus probably crawled along the sea floor and probably had to avoid predators like nautiloids. It was a kind of trilobite called an asaphid, which were trilobites that usually had between five and twelve segments in the thorax, and the pygidium and cephalon were similar in size. The largest complete specimen of Isotelus rex was found in Manitoba, Canada in 1999. Isotelus maxiumus, another large species, has been found in Ohio. I. Rex is cool. But I like T. Rex better. I also like F. Cattus. If you like T. Rex, you might like to read a blog about dinosaurs! I had to look up "F. catus" and it turns out it's a feral house cat. And I really love cats! But I do like the pets better than the feral ones because the feral ones mess up the environment.